Last October, the group came to Temple Square and asked for tickets to attend the males-only Priesthood session. They noted that attendees do not need to be members of the Church–non-member males are welcome to attend. Unlike traditional protestors that bring signs, shout slogans, and raise a ruckus, they employed none of these methods. They simply stood in the “standy-by” line, approached the front of the line, and asked if they could attend. One by one, they were told no. They simply walked away. However, there were photographers there. 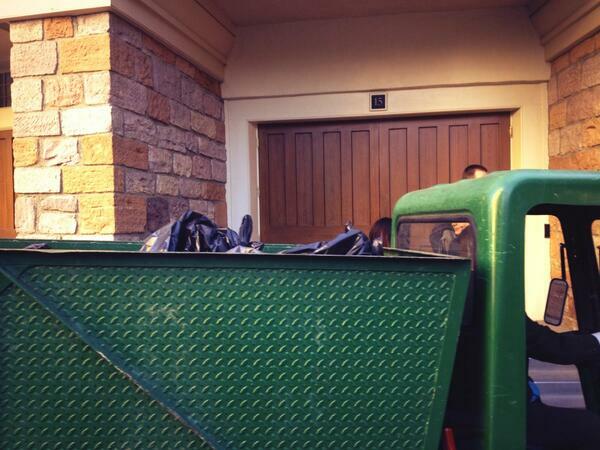 In one photo, either by accident or on purpose, a garbage truck was parked in front of one of the tabernacle doors. The image went viral, (as did many of the sad women’s faces), and the Church got a black eye in the public relations department. An editorial in the Salt Lake Tribune said that the Church’s response to Kelly amounted to intimidation. as a public communication it shames the women who are seeking equality by insinuating that their actions detract from, rather than contribute to, the strength of Mormon women. If this letter really were a private communication rather than a published declaration, the relative size of the movement could be construed to be a statement of fact. As a public communication, however, it acts, instead, like an attempt to intimidate a minority population into submission through drawing attention to their minority status. It communicates to members of the majority that they have no reason to take the pleas of the minority seriously. Public statements are more ethical when they address principles and official positions rather than people and organizations. Making a public assertion in the form of a private letter degrades those to whom the letter is addressed, especially when the words of the letter minimize the position of the addressees. Public statements should be written as public communications and private letters should be kept outside the eye of the media. Private dealings should not be intentionally released to media for the purpose of minimizing positions of minority populations. Such tactics are immoral and do not bolster the credibility of those who employ them. In the Parable of the Unjust Judge, Jesus tells of a woman who pesters the judge until he finally gives her what she asks for. Then he gives a message telling us we should pester God, because God is righteous, unlike the Unjust Judge. God will give us what we righteously seek. Gentiles agitated for change in the Law of Circumcision. Up to that time, Christians were required to be circumcised and baptized in order to join the Christian Church. There was a big meeting in Jerusalem in the Book of Acts. It was heated. People on both sides of the debate got mad. But eventually, the rule changed. This was because of agitation. When God told Abraham he was going to destroy the city, Abraham agitated for change. He eventually whittled God down from 100, to 50, to 10 people. God was willing to negotiate. Many of the revelations we have in the D&C came from agitation. Emma was agitated about tobacco spit on the floors, so we got D&C 89. Oliver Cowdery agitated to translate so we got D&C 9. Joseph agitated to find out which church was true, and he got the First Vision. Many early members agitated to go on missions, and we have several of their mission calls in the D&C. Why should we agitate for change regarding female priesthood? There is a famous interview of President Hinckley, falsely attributed to his famous 60 minutes interview. However, the interview that the quote comes from was actually on Australian television ABC, not Mike Wallace. RB: At present women are not allowed to be priests in your Church. Why is that? GBH: That’s right, because the Lord has put it that way. Now women have a very prominent place in this Church. They have there own organisation. Probably the largest women’s organisation in the world of 3.7 million members. There own ???. And the women of that organisation sit on Boards. Our Board of Education things of that kind. They counsel with us. We counsel together. They bring in insight that we very much appreciate and they have this tremendous organisation of the world where they grow and if you ask them they’ll say we’re happy and we’re satisfied. RB: They all say that? GBH: Yes. All except a oh you’ll find a little handful one or two here and there, but in 10 million members you expect that. RB: You say the Lord has put it that way. What do you mean by that? GBH: I mean that’s a part of His programme. Of course it is, yes. RB: Is it possible that the rules could change in the future as the rules are on Blacks ? GBH: He could change them yes. If He were to change them that’s the only way it would happen. RB: So you’d have to get a revelation? GBH: Yes. But there’s no agitation for that. We don’t find it. Our women are happy. They’re satisfied. These bright, able, wonderful women who administer their own organisation are very happy. Ask them. Ask my wife. Obviously there are a lot of parallels with black priesthood ordination, and you may hear a conversation like this on Facebook or some other venue, so let’s correct some things as we talk about this revelation. You may hear something like this. a) The 1978 revelation was the result of some masterful, cutthroat office politicking on SWK’s part that would make Machiavelli himself envious. There’s some truth and fiction mixed together with this assertion. The fiction is the “cutthroat office politicking”. The truth is that in 1969, a vote was held to remove the ban (under President McKay). Apparently nearly all were there except for apostle Harold B. Lee. When he returned, he refused to go along with the vote, and got the vote reversed. Under the McKay administration, there were a lot of hurt feelings among quorum members, with Hugh B. Brown of the First Presidency in favor of eliminating the ban, and Lee opposing it. b) Kimball really only got serious about it in Fall, 1977. This was when Camilla was so worried about him because he wasn’t coming home nights. The only person who knew where the prophet was was the church security guy who escorted him to the temple after it was closed for the night. There’s some truth and fiction mixed together with this assertion. The fact is that Kimball was always concerned about minorities, and even back in the 1950s spoke about treating minorities (especially Native Americans) with greater respect. According to his bigoraphy, as early as 1975 he was contemplating this issue. c) Imagine being 80 years old and realizing that something you have believed and publicly defended your entire life is wrong, and that you are going to have to do a public 180. Unnecessary attacking commentary, although I’m sure it did weigh heavily on Kimball. d) He also realized that it was up to him and could not be delayed or put off. “I have to do it, because I know that my successor won’t.” Yeah, he had ETB sized up accurately. Unnecessary attacking commentary, but apparently somewhat accurate. While Benson was certainly politically conservative, and while he condemned the Civil Rights Movement as a communist conspiracy, he was also the president that named the first Black General Authority, Helvicio Martens. So, once again, another unfair comment. e) Once he made the decision, he spent several months begging, pleading, demanding, bribing, arm-twisting, whatever he had to do to get the support of the quorum. Total misrepresentation of what happened. Read my post on the Non-Verbal 1978 Revelation. f) He got ten of the twelve to support him, but Delbert L. Stapley and Mark E. Peterson wouldn’t budge. So SWK had to wait. And when Stapley had to go in the hospital with a serious illness, Kimball saw his chance. He hurriedly sent MEP on a week long tour of South American missions, then called a meeting of the quorum where he presented Official Declaration 2, and called for a sustaining vote. It was unanimous *among the ten men present*. Once again, a bit of an unfair representation, with a bit of truth. You can tell a cynic wrote this. g) Stapley rolled with it when he was informed of the quorum’s action, but Peterson was furious when he realized he had been played. He gave his consent only after getting a concession that the church would still advise against interracial marriage. That is how we wound up with that stupid paragraph in the YM manual UP UNTIL LAST YEAR. When I mentioned to a friend in OW that I disagreed with OW’s tactics, but supported them anyway as beloved sisters and brothers and wished them well, she replied how refreshing it was to receive a message of support even though I disagreed. I shouldn’t have been surprised, but I was. Here is what else she said: “Yeah–I recently one person ask what he could do–short of supporting us (since he doesn’t). Thank goodness for that kind gesture. “We have asked people to fast and pray for us and/or regarding the question of female ordination. That is something everyone should be able to do. And if you decide to do that, tell us that you’re doing it. “I told him to–please–overwhelm our email inbox with messages of love because trust me, our email inbox is overwhelmed with people calling us b*tches, worshippers of Satan, *ssholes, and other things I won’t even spell with asterisks. We have SO MANY church members telling us to leave. SO many saying we should be excommunicated. Just today, someone reminded us that heretics used to be burned at the stake for doing what we’re doing. Okey-dokey. “And we have purposely NOT published those things. If we wanted to embarrass the church, we could put up a website that would get thousands of hits a day–with messages from priesthood holders telling us horrible, horrible, hateful things. “Notice that we haven’t done that. We don’t want the church to look bad. We love the church. We are the church. “So seriously–if you have anything nice to say at all, say it somewhere so we’ll read it. There are lot of bruised and battered OW women out there who are a lot more faithful than I am. People are needlessly nasty on both sides. It seems that the nasty people on both sides of the issue taint the other side. It is politicking at it’s Machiavellian worst. In the words of Rodney King, can’t we all just get along? And finally, with regards to agitation, what’s wrong with it? I enjoyed Andrew’s post on a progressive atheist’s perspective, but let’s also see what a protestant who graduated from BYU thinks about this issue. Here’s Ms. Jack from Clobberblog. You probably don’t know that, had a movement like Ordain Women existed back when I was a teenager, I probably would have come a lot closer to joining the church than I did. I continue to attend a church that ordains women and offers them full participation in the life of the church. My infant son was dedicated a few weeks ago (the credobaptist equivalent of a Mormon blessing & naming ceremony). The pastors who performed the ceremony were female and I laid my hands on my son during it. Somehow, the world managed to not explode. What Kate Kelly is doing is not much different than Martin Harris or Oliver Cowdery. If she is asking for something she shouldn’t, then God should let us know as he did Oliver and Martin. If she is asking for something she should, then like Emma Smith, we may get a new section added to the D&C. Either way, there is nothing wrong with Kate agitating faithfully. It has been done countless times in the past, and there is evidence of women performing priesthood functions in our Bibles in ancient antiquity. So what’s wrong with agitation? How is Kate Kelly different from Oliver Cowdery, Emma Smith, the early Gentiles in Paul’s day, or the Parable of the Unjust Judge? Interesting thoughts. Showed up in my facebook feed and then disappeared, which seemed strange. The Salt Lake Tribune editorial is really excessive. I liked how you addressed the comments on Kimball that seemed to go overboard. I know, short comments, but mostly just found what you had to say interesting, just don’t have much to add.